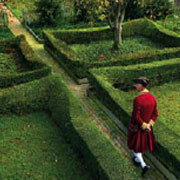 Colonial Williamsburg is a distinctly familiar American icon: a national treasure. Its not-for-profit foundation planned to develop a historically inspired spa. And bundle it with a collection of hotel, dining, golf and retail entities to form a resort experience. How do you market a site known for its historical value, and extend that very specific appeal to include a high-end resort? Additionally, we identified the need to attract new customers with a contemporary palate for spa and golf while remaining true to Colonial Williamsburg's historic surroundings and mission. A key part of research showed that the core communication targets' values were shifting toward greater authenticity and relevance. We realized that those values ranked high (relevant to others in play) when selecting a resort experience. From groundbreaking through launch, we helped develop the new 20,000 square foot Spa's concept and related the appeal and efficacy of Colonial-aged therapies to today's. In fact, positioning of the entire Colonial Williamsburg Resort Collection was rooted in the past and present: the prime luxury resort that could claim such history. Travelers who valued heritage and also contemporary graces were delivered a sense of belonging to the essence of America. Whether partaking in golfing, dining or even retail shopping, guests felt part of time-honored traditions. The best of the American experience.